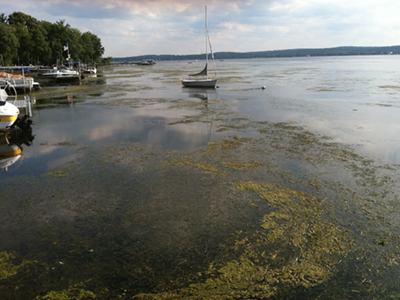 EcoLogic completed a dredging feasibility study for selected nearshore regions of Chautauqua Lake to provide a realistic assessment of the costs, benefits, permit requirements, and environmental issues associated with dredging. The project began with a compilation and review of existing data followed by design of a focused field program to identify specific regions of the lake’s nearshore zone impaired by excessive sedimentation. During the field program, EcoLogic surveyed segments of the littoral zone, tested the quality of the sediments, selected appropriate technologies for sediment removal, and developed unit cost estimates. Our associate engineers identified candidate areas for sediment dewatering sites. We also reviewed the regulatory environment, documenting the necessary permits and approvals for implementing a dredging program. The project, completed in 2013, included public information sessions.